Suncoast Christian College is passionately and practically committed to building strong partnerships with the Aboriginal and Torres Strait Islander peoples, both within our local, and the wider community. Our goal… to foster meaningful and transformative engagement with Australia’s first peoples. Our focus lies with identity and engagement which is manifest in the various projects and programs that are undertaken throughout the school year – projects that are both in response to student and teacher initiatives. A key component of our Indigenous program is the strong partnerships we are building with local (Sunshine Coast) Gubbi Gubbi organisations and with other Aboriginal and Torres Strait Island Peoples. Aboriginal and Torres Strait Islander students are able to see their cultures reflected in the curriculum and can build their self-esteem and identity. 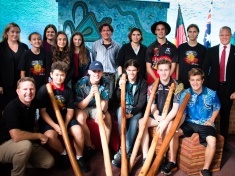 At Suncoast we have between 25 – 30 Aboriginal and Torres Strait Islander students. 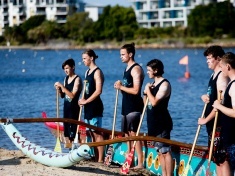 Our Identity focus involves projects such as the Didgeridoo making and playing workshops, Indigenous outrigger team, leadership training and specialised cultural learning. Indigenous student leaders work with Suncoast staff to organise and run initiatives. 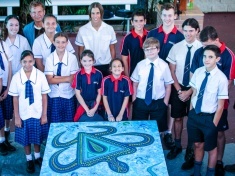 All Suncoast students have the opportunity to engage in reconciliation, respect and recognition of the world’s oldest continuous living cultures. Teachers across all year levels and subjects include Aboriginal and Torres Strait Island histories, cultures and perspectives into learning according to relevance. Our engagement focus at Suncoast also involves events such as Reconciliation Assembly, visiting speakers such as Goombuckar Cultural Bus and Gubbi Gubbi Dance Troupe. It also includes school projects such as our recent painting of the mural in Djan Durman that included over 100 Suncoast students.